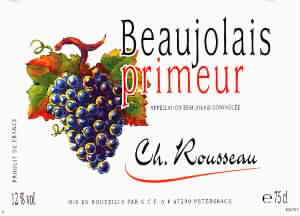 This was the third of the new crop of Beaujolais that we tried in 2001 and it was the first that I didn't to finish. Basically this wine was far too acid and it had no real redeeming points. I suppose that it is hard for a shop to select a Beaujolais Primeur because schedules probably mean that they do not have an opportunity to actually evaluate the wines before placing their orders. Better luck next time chaps but I certainly hope that Eurospar do not buy from this source again. DeM3.49 from Eurospar throughout Germany.